Chelsea attacker Willian has dismissed speculation linking him with a potential move elsewhere during the January transfer window. The Brazil international has been regularly linked with a move to Manchester United since their failed approach for his services last summer. 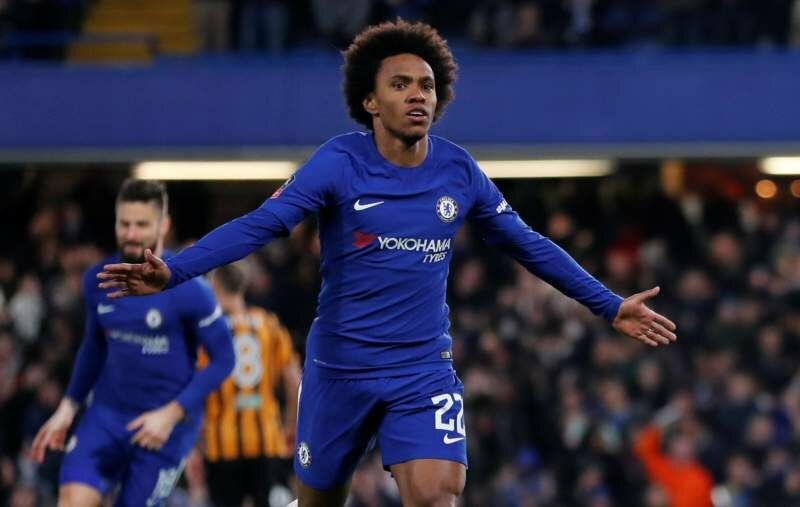 Willian has been a regular off the substitutes’ bench in the Premier League, but he made most of his chance of Tuesday night as he contributed two assists and one goal in the 3-1 triumph over Huddersfield Town. Shortly after the game, the Brazilian was asked about his future beyond January, to which he replied: “I hope not! I’m happy here and the fans can be calm. The win sees the Blues close the gap to leaders Manchester City to 11 points, although the Citizens have an extra game to play versus Swansea City on Wednesday night. Conte has twice suggested that the Blues are out of this season’s title race, but Willian has stressed that the team will fight till the very end to retain their English crown. Chelsea will return to Stamford Bridge for Saturday’s afternoon kick-off versus Southampton, and they could expect a tough encounter with the Saints tending to maintain a defensive formation on their travels. The South Coast outfit most recently lost 2-1 to Manchester City on the road after Raheem Sterling sealed the final in the dying seconds of the game. The game could have serious implications for the top four race.